Armed robbers caught up with a victim around Okigwe roundabout, directly opposite Government House, shot sporadically into the air before ordering their victim to hand over the money. He resisted and was shot three times before his money was snatched and they took off through Okigwe Road, and all this happened before the eyes of some fleeing policemen. According to an eyewitness, “I was at the newspaper stand across the road, just before the Okigwe roundabout, around 11a.m, when I heard a gunshot and then two young men in a Camry car blocked a man and his wife driving in another car. 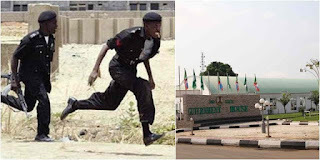 The eyewitness added that policemen, including personnel of the NSCDC at the roundabout opposite Government House, fled as soon as the robbers shot in the air. “I was four cars behind. When I heard gunshots, it dawned on me that those in the Camry were robbers, because the way they overtook me made me wonder where they were hurrying to. Daily Sun reports that the State’s Police Public Relations Officer, confirmed the incident and disclosed that the victim was confirmed dead at the Federal Medical Centre, Owerri.